These milk chocolate frogs are filled with buttery toffee bits and pop rocks! Let it linger in your mouth and feel the "explosion"! 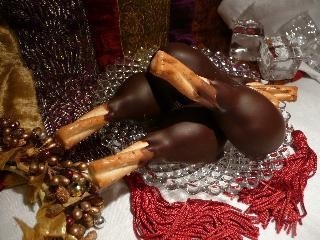 2-1/2" x 1-3/4" x 1/2"
The best part of the turkey, made of pretzels dipped in caramel, milk chocolate and dark chocolate. 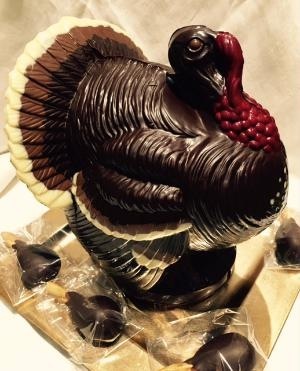 MEDIUM TURKEY - $20.00 This 8" high, hollow turkey is made of delicious milk chocolate. It's dessert for the whole family, and these turkey leftovers make great chocolate chip cookies! About 16 oz. This 9" tall, hollow chocolate turkey is molded in high quality dark chocolate with feathers and fine details using white and milk chocolates. Served to you surrounded by Turkey Drumsticks (pretzels dipped in caramel, milk chocolate and dark chocolate). Made to order - please allow one week for your turkey to be ready. About 3 lbs.